Are you of the opinion that the invasive Transportation Security Administration “pat downs” at airports are a violation of your constitutional rights? Wait until they start treating you the way they treat investigative journalists, writers, filmmakers and activists who question the many official conspiracy theories and non-conspiracy theories. The mass media is 99.9% controlled, but the corporatocracy cannot tolerate a few investigative journalists blowing the whistle. Her laptop, camera and cell phone are routinely seized and not returned for weeks. On several occasions, government agents seized her notebooks and copied them—violating her journalist-source relationship. Her credit cards and receipts have been copied on numerous occasions. Time after time, Department of Homeland Security (DHS) agents have detained and interrogated her in foreign airports. They threatened her that she would be barred from boarding her flight back home. This chilling treatment escalates, even though Poitras has never been accused of violating any law—and the DHS has been forced to admit that in six years they never found anything to justify their continuing abuse and harassment other than they didn’t like her expressing non-official viewpoints. Our security is guaranteed by a free press. We have no security if free speech is repressed—especially by the big lie that it is being done in the name of national security. 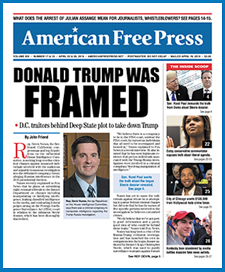 Be thankful that you have the right to be forewarned about these threats to your freedom and security—just as we at AMERICAN FREE PRESS are grateful to you—and all of our readers for keeping our torch alight in the vast darkness of censorship and lies.